The approach to clearly understand the 183-day rule, under the guidance of SARS interpretation note 16, is one based of two components. The 183-days test as well as “employment income”. If you are not in employment (i.e. independent contractor agreement) then the 183-60-day exemption will simply not apply to you. 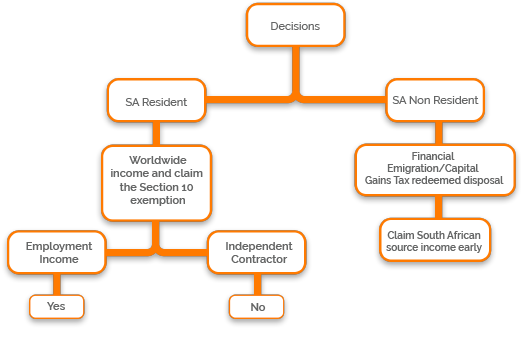 As a South African tax resident, worldwide income needs to be declared and in addition claim the 183-day rule based on having a “employment income”. As a South African non-tax resident having financial emigrated and undergone the capital gains tax disposal event you will only need to disclose your South African source income and the 183-day rule will not apply.